The practice of chiropractic has evolved in many ways since it was founded in 1895. Originally a pseudoscience of sorts, chiropractic medicine underwent a period of scientific reform in the late 1900s, with serious research conducted to test its theories. Recent advances are also paving the way for chiropractic’s bigger role in improving the effectiveness of addiction treatments. 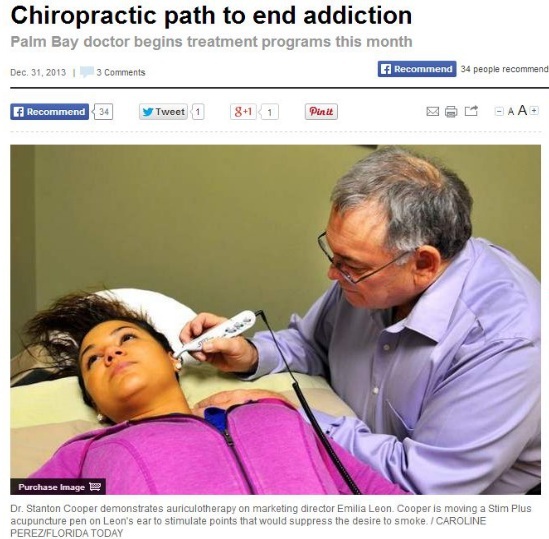 A Florida Today article dated January 14, 2014 discusses how the practice is gaining wider acceptance as a useful tool in addressing mind-body-spirit factors that induce addiction—a trend that progressive NYC chiropractors are most certainly following. Among other things, chiropractic’s role in the treatment of addiction lies in the idea that positive emotions are not confined to the area of gray matter that lies within the cranial cavity. Rather, as the article points out, human emotions are also influenced by the spine. By ensuring proper spinal alignment, neurotransmitters can more efficiently deliver feel-good neural messages from the brain to the body. Once these messages are able to flow freely, traditional addiction treatments, which are usually designed to control the reward centers of the brain, can be used to supersede the body’s craving for an addictive substance. Although the exact science of how chiropractic can positively influence addiction treatment outcomes has yet to be established, the article notes that several studies have observed overwhelmingly positive effects. One study in particular found that when addiction treatment programs were complemented by chiropractic adjustments over a 30-day time span, all of the participating patients completed their respective programs. In this regard, several chiropractic methods are currently being tested. The Torque Release Technique and auriculotherapy, which is otherwise known as ear acupuncture, are cases in point. The former aims to trigger the release of endorphins by stimulating specific points in the outer ear. This, chiropractors believe, can help minimize addiction cravings and curb one’s desire for the addictive substance. The latter, on the other hand, works by stimulating points on the ear that are connected via embryological origins to deeper levels of the brain. It facilitates relaxation, harmony and a sense of well-being, also reducing cravings. In any case, the treatment of chronic pain remains at the heart of any chiropractor’s practice. Patients can overcome chronic pain and possibly their reliance on pain medication by visiting a trusted chiropractor in NYC like Dr. Steven Schram. By ensuring optimum spinal alignment, such a qualified practitioner can enable patients to enjoy better health and quality of life.